We regularly get asked what birds are best for various purposes, but one in particular is for the table. And to be honest I think every smallholder would love to find the ‘ultimate bird’; one that not only supplies a sufficient number of eggs per year (or week), but that carried sufficient body weight (and growth rate) suitable for the table.I'm just not sure such a bird exists. In recent years we have primarily processed excess roosters for the freezer; a sub sequence of breeding and hatching. -Indian Games are a smaller framed bird (even the large size that we breed) their mass is predominantly muscle and therefore they have a greater meat yield. The slower growing breed are better suited to free ranging, this does produce a darker (sometimes yellowing) and tasty flesh, though this may not appeal to all. Their docile nature does mean roosters can live together. Average age 7-8months/ 2-2.8kg dressed. The paler meat and light feathers/skin etc. are generally more appeasing to the general consumer. Some males may live together if reared together from hatching, however the breed are known for aggressive male behaviour, so this generally only lasts until working age/when crowing begins (which maybe as young as 10-12 weeks). Average age 3-6 months (depending on behaviour)/ 1.0-1.8kg dressed. However in recent years these have been few and far between. As between maintaining our own stock; due to losses, replacements coming of age, equipment failure (I needed to replace the incubator) amongst other issues. In mid-2015 we even sourced some ‘heritage style table birds’ from a hatchery and purchased and flew them up as part of a group- only to be disappointed with the results. [And we were not the only ones who didn't see the anticipated results]. As they were slower growing and smaller than the pure IG and Sussex we reared around the same time. So it’s safe to say it's been a while since we had home grown chicken on the menu… So this year we may have gone a little overboard! Chicks are generally something people associate with spring, but chicken eggs will actually be fertile at any time of year (given the hens are laying and rooster in working). So here with the tropical condition we generally incubate during autumn and winter; with cut off generally being mid-November, to avoid raising young birds through the wet season. This year we broke that rule, not only did we not incubate in autumn (due to going overseas) we did incubate upon our return and continued to do so into early December; as the Indian Games were laying. And as these birds only lay for short periods of time throughout the year (for a month in every 3 or 4) you incubate when you can. We purchased our original Indian Game stock with the intention of crossing them with the Sussex (and laying flock we already had). As the concept was to produce a meatier bird, with a larger frame that laid reasonably well… the smallholders ultimate bird. To date this idea has never eventuated, though we have not dedicated time or resources to attempting to breed and rear them either. This year however we decided to make the best of an unfortunate situation- lost an Indian Game rooster in the early part of the laying season. So we decided to place the Sussex rooster in one tractor with half the Indian Game girls and try. So we incubated both pure Indian Games and Indian Game cross Sussex (ended up purchasing a second incubator so we knew which hatchlings were which)… though to be honest now they are old it is obvious anyway. Along with our experimental hatchlings we came across the opportunity to purchase some ‘Ross’ parent flock chicks. These arrived via transport on the 19th December. Ross’ are a hybrid, selectively bred for commercial poultry production… so what you buy from the shops. They are generally referred to as ‘broilers’ developed for maximum growth and meat yield. There are other hybrids developed by other suppliers, often hear them referred to as ‘Ross-Cobbs’, these are actually two different birds but both are commonly used, and are very similar in appearance. smallholding. However not only did I find they were more susceptible to illnesses, but found they lacked a number of general chicken behaviours and were not particularly compatible with a free range environment; as they gain weight and mass quite dramatically over a short period of time they are larger than birds we generally move out of the brooder box and outside, but they were not yet fully feather and therefore more susceptible to the weather. As they grew older their mass meant moving became slow and cumbersome, and we had to remove feeders to stop them sitting in their own mess and eating. We had postponed D-day for one flock for 2 weeks(due to other commitments), meaning these birds were approximately 3 months old by time of slaughter. During which time the birds became so large and movement so restricted culling became necessary due to their lack of quality of life. Commercially ‘broilers’ reach market weight and therefore slaughter by 40 days, so less than 7 weeks. We have accidentally reared one to over 6 months of age. She was sent to us from a hatchery as a ‘Light Sussex’. We even had a few eggs from her, eventually she pasted in her sleep curled up in her spot. 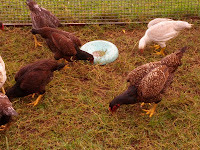 However the rational being that whether we purchase and rear them, or whether we purchase free range chicken from the stores (which we have been for some time); they will be ‘broilers’, so we may as well feed and rear them- this way we know how they have been treated and how much free ranging, exercise, daylight they have had, what treatments or chemicals (if any). To date we have sold a few of the younger/smaller female crosses. We will not need as many as we hatched; so not only will that pay for a few bags of feed, but it maintains their living conditions in the longer term. At the moment they are housed in tractors that rotate around the garden, allowing for grazing, and are free ranged rotation-ally, to ensure the other birds do not eat all their food. The Ross’ have been transitioned to their outdoor shed and have undertaken their 'holding period' where we gradually allow them greater free ranging time until they are eventually fully free ranged- ensuring they know where 'home' is. We are not sure whether this may change with age, or whether it is a result of free ranging them with another breed, so far they are expelling all my reservations from our previous experience. They are relishing the free ranging conditions; scratching, foraging and running around, displaying 'normal' chicken behaviours. They have been indoors longer than we would have likes, as although only one month old (and still quite sparsely feathered) these birds are already en-par (size wise)with their Indian Game cohabitants, who are twice their age and far too large to remain indoors. We have only prevented free ranging/transitioning earlier due to the torrential rain of the previous fortnight. During which the crosses had to return to their transitional housing for fear of losing the flock to the wet. [This is why I try not to incubate so late, though this wet was a little earlier than the last few years] Thankfully this week’s drier (though exceptionally humid) conditions have allowed for everything (and everyone) to dry out a little. So from no chicken to potentially a years supply… Should be interesting to compare their progress and their outcome. We will keep you up to date on the tablebird project.